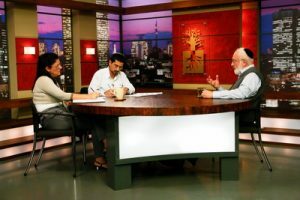 Question: Is there a concept of “atonement for sins” in Kabbalah? Who is to blame if the Creator controls everything and a person is completely under His management? Who can determine the length of the person’s stay in the cities of banishment for a crime? Answer: The thing is that everything written in the Torah, The Book of Zohar and other Kabbalistic books speaks only about the upper world. When I studied with Rabash, I would recite a passage from the Babylonian Talmud to him and he would explain what the people who wrote it meant from a spiritual perspective. It was very interesting because everything seemed completely different: they wrote in the language of the branches of our world while implying the upper roots. For example, people who committed crimes were sent to the cities of asylum for six years. Although our world is seemingly separate from the spiritual world, the six years represent the six Sefirot of HGT NHY, which a person has to go through in order to advance from Malchut to Bina in the seventh year, and those six years are reflected in our world. The subject of study of the wisdom of Kabbalah is actions of the Creator, which give us an opportunity to assemble Him from parts: from our thoughts, desires, all sorts of actions, irreconcilable differences, mistakes, and successes. The main thing is that from all this work of disassembling and assembling we come to understand Him, feel Him, and be like Him. This is the uniqueness of our work as opposed to the different endeavors of this world. Perhaps in them there is something similar to analysis and synthesis as well, an understanding. In fact, this is how we study all inanimate, vegetative, and animate nature: we dissect, examine, understand, and register. However, in Kabbalah we are not dissecting ourselves, our animalistic body. Instead, we connect and disconnect with each other. Only through the connections between us will we be able to understand who the Creator is because He is revealed only within them. This is special work that does not have an analog in our world. It is called the work of the Creator. After all, He entrusted it to us so that we would get to know Him and become like Him. The path to this lies only through the connection between people. Yet connection is impossible without disconnection: the achievement of unity does not happen without resistance. That is how it happens in all the actions: ascents—descents, convergence—distancing, inhaling—exhaling. Kabbalah is the science of connection, the attainment of unity. There is no Creator outside of us. He is revealed in the connection between us. This connection does not exist in nature by itself, only if we assemble it. We learn that there was a restriction and second restriction and so the degrees were formed up to this world: the upper worlds, spiritual Partzufim and Sefirot. However, this all exists only in potential in case the created beings come and begin to attain these qualities. We will discover the degrees descending from above downward if we want to awaken them from below. If we do not awaken them, it is as if they do not exist at all. There is nothing to talk about without the one who attains. The Creator is revealed only within our connection, which is not corporeal or forced, when we feel our dependence on one another or have special feelings for each other. This connection happens in a completely unnatural, even anti-natural way. Only to the extent that I discover my own nature, the evil hidden in me, the unwillingness to connect with others, in the part that I managed to purify from my “I” with the reforming Light, is there a measure of bestowal revealed. It is not bestowal yet, but a readiness for it, the degree of Bina, Hanukkah. It is possible to achieve a common mind in the workplace through workshops. We sit in a circle imagining that we are meeting on holiday or in retirement, which enables each person to feel free and reshape themselves through role playing. In order to change internally and build a common vessel, we start with relaxation and warm-up exercises. We learn to express a more positive attitude through participation in exercises involving speaking, motion, looking, and listening. We reshape ourselves through compliments, diminishing ourselves, elating the others, and raising the value of the whole team by becoming more incorporated in them. Whenever each person feels egoistic negations and criticism toward the others they learn to show the opposite, positive attitude. Each one works on himself in relation to the circle and then shares his impression of the exercises and the resulting sense of warmth, connection, mutuality, and closeness.